Please note that the modules are unpublished by default. In the administrative backend go to Extensions → Template Manager. Click on Options and set Preview Module Positions to enabled. Navigate to the website page you wish to see the module positions for in your web browser. Click into the URL field in your browser. Look for any "parameters" at the end of the URL. These are separated from the main part of the URL by a question mark. For example, in the URL http://mydomain.com/index.php?id=17, the "id=17" is a parameter. If there are no parameters, append "?tp=1" to the URL and press RETURN.For example, http://mydomain.com/index.php?tp=1. If there are already parameters in the URL, append "&tp=1" to the URL and press RETURN(ENTER).For example, http://mydomain.com/index.php?id=17&tp=1. The module positions will be outlined in red. Clicking on any of these modules will open a control panel from where you can set the status, position, title, access level (Guest, Public, Registered, Special, Super Users), the assignment on your website and more. 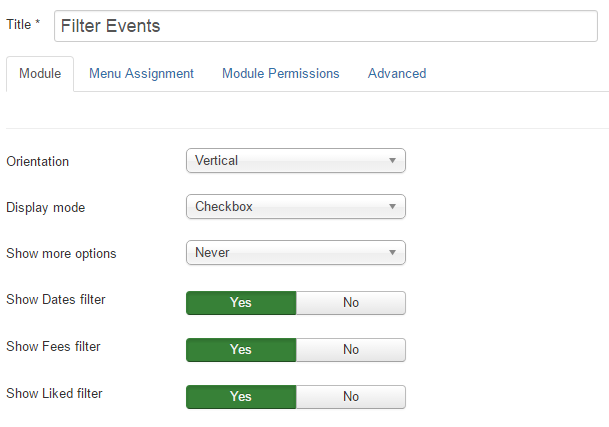 Filter Events module allows the users to filter the events by selecting the desired criteria like: All registration, All distances, Upcoming events, All likes. Orientation: choose how the filters will be displayed on the site: Vertical or Horizontal. Display mode: select the display mode for filter's options: Checkbox or Drop down select. Show more options: this feature is disabled by default. Select the number of options which will be displayed on the site. After the selected value, the next options can be seen only if you click more options button. Show Dates filter, Show Fees filter, Show Liked filter: choose Yes for the filters that you want to be displayed on the site. 1. All registrations: Filters the events based on the registration starting and ending date. - Open: Displays all events for which you can register at that moment. - Upcoming: Displays the events whose registration date didn't start yet. - Closed : Displays the events for which registrations were closed. 2. All distances: Displays all the events having the distance between your location and the event lower than the selected value. 3. Upcoming events: Filters the events based on the starting and ending date. 4. All fees: You can choose between free events or paid events. 5. All likes: You can choose to see all the events that you liked. 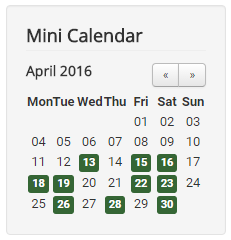 Activate this module if you want to display all events in a mini calendar on your site. Users can see the events dates marked on this monthly view calendar, they can navigate to any month/year using the next and previous buttons. Click on a marked day if you are interested to see all the events scheduled on that day. 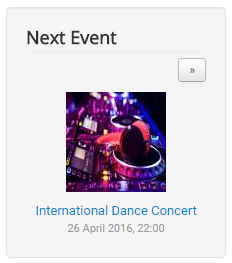 The module Next Event will display the first available event which starts after the current date. The navigation buttons allows you to switch to the next/previous event.